Common Job Interview Questions- Why did you leave your job? Interview Questions- Why Did You Leave Your Job? One of the most common job interview questions explores what is your reason for leaving your job. This can be a tough question to answer. You are going to be asked this question by the interviewer and having a well prepared answer will ensure you come across as confident and comfortable. 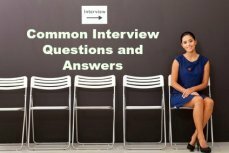 Use the sample interview answers to help you prepare a response that you are happy with. Be ready to handle this tricky interview question in a professional and credible manner. "What is your reason for leaving your job?" Be straightforward but avoid negative comments about past employers in the job interview. Don't bad-mouth the company, your manager or colleagues, it puts you in a bad light. Keep it positive and make the reason for a leaving a constructive one such as a new challenge, exciting opportunity, increased responsibility or learning possibility. Use this job interview question as an opportunity to look ahead. "I have reached the ceiling in my particular job and I am ready for more responsibility"
"After a number of years in my last position I am now looking for a new experience where I can contribute and develop in a bigger environment"
When asked common job interview questions like this, relate how you worked hard in your last position and now you want to use your skills and experience to benefit the new job opportunity. "I am interested in an opportunity to use the skills and abilities I have developed over the last couple of years in a new and challenging position"
If there is an obvious issue with the company you were working for, such as layoffs, acknowledge and discuss this. "There is a great deal of uncertainty about the security of our jobs. I am looking for a stable company where there is the long term opportunity to grow and advance"
Sometimes, it is just the wonderful opportunity offered by the new position that made you consider a move. "In all honesty I wasn't really looking to move jobs, but this looks like such a great opportunity to use all my skills and experience and I have always admired this company"
Location is a perfectly acceptable reason for moving. You may have taken time out to raise a family. Use this as an opportunity to reassure the interviewer that you are now ready to return to the workplace and detail the child care arrangements you have put in place. Point out to the interviewer the efforts you have made to keep up to date in your particular field. Taking time off to study is a positive reason. Highlight how this has taken your skills and abilities to a new level, and how it demonstrates your desire for self-improvement and growth. A travel break can also be seen in a positive light. Emphasize how it has added to your life experience, enabled you to deal with a number of new challenges and increased your self-confidence. The reasons for deciding to spend time traveling should show you as an individual who is keen to learn and grow. "I believed that I had reached the ceiling in my previous job. I needed to make a career move and decided that I would take the opportunity to spend some time fulfilling my dream and travel before looking for a new position. I have discovered so much about myself and developed a number of skills dealing with all the challenges I faced. I am really excited about returning to the workplace and using all I have learned to contribute in a positive and constructive way"
Avoid stating your salary as a prime motivator for change. It may create the impression that you will also leave this company as soon as you find a higher paying job. Make sure the reason you provide for leaving is congruent with the reason you have provided on your job application and the reason that will be given by your previous employer when a reference is done. Reasons for Leaving a Job - all the right explanations. "Where else are you interviewing?" Prepare a list of good questions to ask the interviewer. Use the job interview question list to have some insightful questions ready when you are asked "Do you have any questions?"